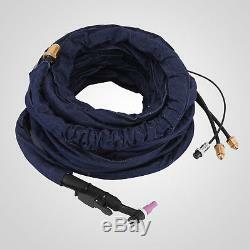 WP-20 25-ft 230 Amp Water-Cooled TIG Complete Welding Torch with Accessories. This product is weldng machine parts of arc series, as auxiliary for argon arc welding machine and complete the welding process. 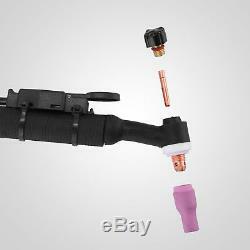 Welding torch is used to clamp tungsten, conduct current and convexing shielding gas. The torch is 25 feet long, and has a 35% duty cycle at 230 amps. According to welder capacity and gas path, the characteristics of the circuit to select the approprite welding torch. 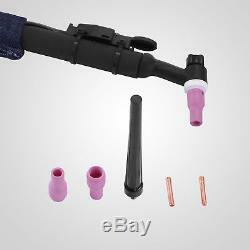 Will select a good tungsten rod, chuck, nozzles and installed on the welding torch on the order. 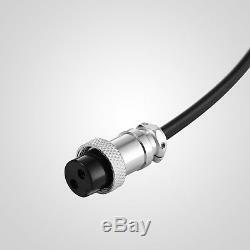 The welding joints and welding torch cable connector connected. Double-check the various parts, identified as meeting the requirements, regulate the welding current, welding torch swith took over the no-load commissioning, if normal, then start welding. Safty technology and protection meatures. To comply with the relevant safety regulations and standards for welding operations. Familiar with the operation of TIG welding technology. Before work, wearing a good labor protection products, check the welding power sorce, and whether the control. 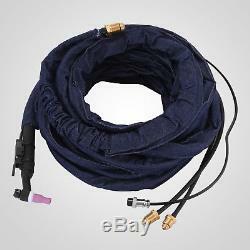 System of the grounding line and protection device is reliable. Check gun chuck clamping force, as well as whether the performance of the nozzle insulation meet the requirements. For no-load testrun to confirtm thge circuit water, gas and smoother, the normal operation is to be. When working, no naked and exposed body parts irz the vicinity of the arc, no smoke near the arc. No feeding, to avoid harmful smoke inhaled, and pay attention to prevent the weldinh head thrown and people wounding. In the workplace of welding should be to keep the air flow. Welding within the container, they should wear masks or special electrostatic dust mask to reduce inhalation of harmful smoke. Welders should wear work clothes and shoes dry. Container peripheral someone care to meet. Work should be to minimize the role of high frequency time; continuous working best not to exceed 6H. Replacement of tungsten, the first cut off the power supply; grinding wheel machine tungsten rod small be placed a good exhaust. Rule out the harmful substances from the welding, ventilation or air supply measures should be taken to. Welding serve flammable, explosive materials, strong oxides or toxic materials, containers, pipes, equipment must comply with safty requirements, safety measures. Welding in the workplace should be fire-fighting equipment, such as fire hydrants sandbox, fire extinguishers, buckets, etc. Prohabited with pressure at the same time chagared with a voltage and containers cans, cabinets, pipes, welding equipment. 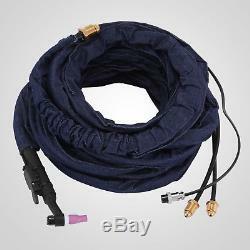 Welding site prohibits the welding cable, gas hose, nire twisted together with mixed. There are remnants of the grease, flammable liquids, gas containers, in the welding must be cleaned before and open the exit cover. Prohibition of inflammable and explosive items in the storage room and venues welding. Welding should be there in the open clam wind facilities. To prevent the splash of mars caused by fire, wind power should not be more than five hours in the open air welding. The workingplace environment, mechanical noise value does not exceed 86dB. High-altitude operations are in compliance with safety requiremrnts on high-altitude operations. Torch operating current less than rated current. Using the welding torch, the welding rated load shall be strict compliance with thte requirement of sustained rate. Cylinder output pressure should between 0.1-0.3Mpa. For the striking arc experiment to simulate an arc welding process, welding torch arc board should swing back and forth, put an end to a long arc at some point in order to avoid thermal radiation buring torch. 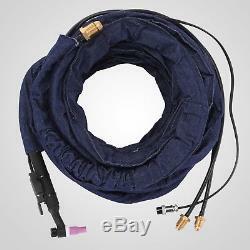 Air cooling welding torch, circulating water pressure 0.1-0.1Mpa. 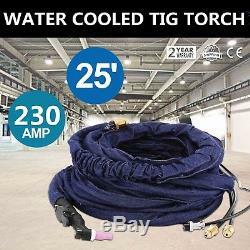 Premium quality 230Amp water-cooled weldcraft style WP-20 (Flexible and Gas Valve) TIG complete torch with 12.5-foot rubber power cable. 230A water-cooled flexible head body with gas valve WP-20. 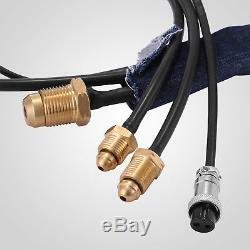 Rubber power cable 12.5-foot. 5/8-18 RH male shield gas, 7/8-14 LH male water return welding current & 5/8 -18 LH male water suppler. Inlet pressure: 0.1-0.3Mpa. Torch control circuit voltage values: The AC of frequency is not more than 42V; DC not more than 48V. 1 X WP-20 Torch Head. 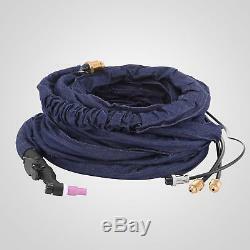 1 X 12.5-foot Power Cable. 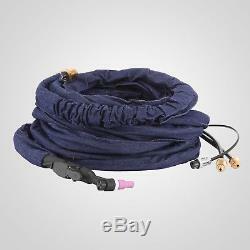 1 X 12.5-foot Nylon Cable Cover. 1 X Alumina Ceramic Cup3/8 orifice. 1 X Alumina Ceramic Cup5/16 orifice. 1 X Long Back Cap. 1 X Torch Collet(1/16). 1 X Torch Collet(3/32). As a leading and emerging company in manufactory and exporting business, we are specialized in Business and Industrial Products, Sporting Goods, Pet Products, Home and Garden products for more than 10 years. We believe that it is our vision and mission to provide innovative products with best service and competitive price to satisfy you. Our goal is to make sure that you can find exactly what you are looking for and make it easy for you to place your orders. If you have any changes, pls inform us. These charges are the buyers responsibility. If you need to return, please check twice to confirm the item not work and contact our customer service representative, let us know the detailed problem and send us some pictures for confirmation. Please make sure that item has NO man-made sabotage. Used items will not be accepted for return. All emails will be responded to within. You want to cancel an order. If you need further assembly instructions for a product. Any other unspecified questions or concerns. Special circumstances will be listed clearly in the listing. Please do check everything carefully after you received the parcel, any the damage except DOA (Dead-On-Arrival) would not be covered if it's your fault. A: The item ships from Rancho Cucamonga, CA, United States. A: Please log on your account. Q: How do I return an item? Please contact our customer service before you return an item. The item "25FT WP-20 Water Cooled 230Amp TIG Torch Complete With Flexible & Gas Valve Head" is in sale since Monday, July 9, 2018. This item is in the category "Business & Industrial\Manufacturing & Metalworking\Welding & Soldering\Welding\Welders, Cutters & Torches\TIG Torches". The seller is "beautydirectmall" and is located in Ontario, California. 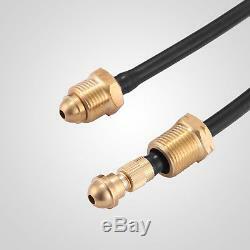 This item can be shipped to United States, Canada, Germany.